The value and volume of construction projects that will be given out this year in Penang should increase by 10%, compared with 2012. Penang Master Builders & Building Material Dealers' Association president Lim Kai Seng said the first quarter of 2012 was slow for the industry, due to the uncertainty of the general election. “According to the latest Construction Industry Development Board Malaysia (CIDB) report, in the first quarter 2012, the volume of construction jobs from both the private and government sector awarded in Penang was only about 10% of the total volume awarded in 2011, which was 514 with a value of RM6bil. “Normally, the figure for the first quarter of the year should be around 25% of the previous year's figure. “The value of construction jobs awarded in the first quarter 2013 was approximately RM651mil,” he said. About 15% of the construction jobs awarded in the first quarter 2013 for Penang came from the government sector. “Now that the general election is over, we can expect more property launches to take off in Penang soon. This is why we are confident of more construction contracts to be awarded in Penang this year,” he said. On construction costs, Lim said prices for building material such as cement and sand had remained stable since late last year. “A bag of 50kg cement is still RM16.50, while the price of sand is RM40 to RM45 per cu metre, more or less the same as late last year. “The costs of construction should remain like this till the third quarter,” he added. To build a 1,000sq ft condominium in the south-west district of Penang today would cost around RM250,000, inclusive of land cost, Lim said. Meanwhile, the Malaysian Institute of Estate Agents (MIEA) expects the prices of all types of strategically-located properties in the country to rise by 10% to 15% this year. MIEA president Siva Shanker said the volume of property transactions should rise by 5% to 10 % this year. 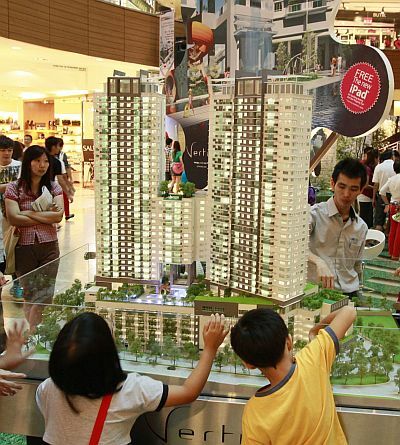 “As the general election is now over, Malaysians with disposable income to buy properties are now in the buying mode. “The real estate market has been getting more enquiries on properties in strategic locations the last few days after May 5, despite the complaints on the irregularities of the general election which have affected the feel-good factor,” he said. Siva said last year, especially in the first half, there was a slowdown in the property market due to the tighter loan conditions imposed by banks. “But now most of the people have got used to the banking guidelines for housing loan. They now have a better idea of the chances to get the kind of loan that they want, which will reduce rejection rate,” he said. 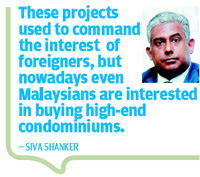 Siva said strategically-located high-end condominiums in the country, especially in Kuala Lumpur, would perform well. “These projects used to command the interest of foreigners, but nowadays even Malay-sians are interested in buying high-end condominiums that come with lifestyle living,” he said. According to the National Property Information Centre 2012 report, the volume of all property transactions recorded 427,520 in 2012, about a 0.7% drop from the 430,403 transactions registered in 2011. The value of all property transactions had, however, increased by 3.6% to RM142.84bil in 2012, compared with RM137.83bil in 2011. The volume of residential property transacted in 2012 was 272,669 with a value of RM67.76bil, compared with 269,789 with a value of RM61.8bil in 2011. Raine & Horne Malaysia director Michael Geh said he expected property prices in Penang to rise by about 10% this year. “There will be more property launches in the next six months, compared with a year ago. Developers in Penang are now getting ready to execute their project plans for this year. “We expect to see large-scale launches in Batu Ferringhi in the north-east district and in Teluk Kumbar and Bayan Lepas in the south-west,” he said. Geh said the tighter conditions on housing loans would weed out speculators, as many of them would find it more difficult to borrow, since they were already owning more than one properties. “We expect less speculators this year and more genuine home buyers,” he added. Geh said that although the demand for high-end condominiums had weakened slightly in Penang, their prices had not dropped.